Kayaking is one of the most popular activities on the Outer Banks for good reasons. The Albemarle and the Pamlico Sounds offer diverse landscapes to explore and see the coastal waters in a different way. 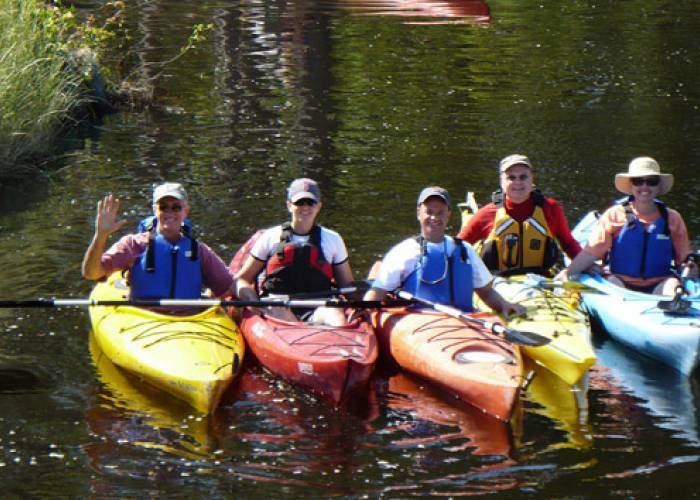 The canals, inland rivers, the ocean and salt marshes are all accessible to you in a kayak. You are exploring, exercising and spending time with friends and family during a kayak tour…all at the same time. Kitty Hawk Water Sports has a tour for every interest. Come out on the water with us and paddle alongside the Outer Banks alligators! At three hours this tour is the longest we offer, so come prepared for many gator sightings! This two-hour tour goes through a salt marsh and exhibits native creatures like ospreys, ibis, wrens, pelicans, and herons. Maritime Forest Coastal Reserve Tour—Located in calmer waters and perfect for first-time kayakers, this tour is one of the most popular. Join us as we paddle around the maritime forest and see a variety of snakes, turtles, and birds. Currituck Sound is a naturally beautiful area filled with canals, islands, and bays. We’ll explore the marsh and see herons, egrets, and maybe even a river otter. Learn about the island that hosted the first English settlement and how all the colonists mysteriously disappeared while you paddle around this historic area. Join us in kayaking around Roanoke Island, learning about its unique—and mysterious—history, and enjoying the spectacular view of the city lights. Full Moon Tour—Come and howl at the moon with us during this two-hour tour lit by the light of the full moon. Experience the wonder of bioluminescence, as well! Kayak around the North Carolina coast and you might even see a black bear, bald eagle, owl, or white-tailed deer! We provide meals and have several delicious menu options. One of the prettiest places in North Carolina, Merchants Millpond is described as a uniquely beautiful place for kayakers and outdoor enthusiasts.